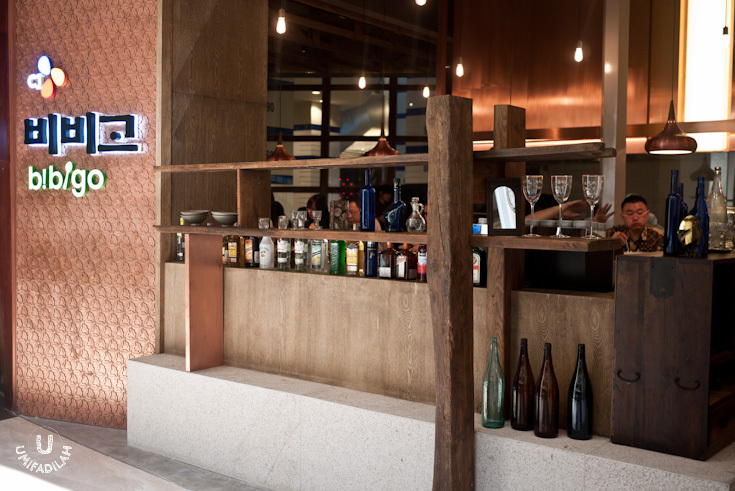 Filling in as replacement for Y&Y restaurant at Pacific Place Mall 4th floor, Bibigo finally opened in Jakarta in early May 2013. I was excited ever since I saw their ads in Pacific Place back in late 2012 (yes, since it's located in front of my office building so I happen to notice it almost every day). Bibigo is Korean food (K-Food) chain owned by CJ Foods, probably the biggest K-Food Company that comprises in food and food service industries for over 60 years. They also started the 'Korean Cuisine To The World' Campaign called "Psy Go Bibigo", named after the world-famous singer Psy which is their brand ambassador. As part of the campaign, Bibigo has recruited chefs from all over the world via YouTube since April 2013 to go on world tour with Psy for a month to promote Korean cuisine. Love the idea! Every news of Bibigo just led me to the peak of curiosity so when it finally opened in Jakarta I immediately paid a visit. Bibigo has two restaurant types: Fast Casual and Casual Dining. I'm not really sure whether it affects the food in terms of prices, but here in Jakarta the concept is Casual Dining. Right when you enter Bibigo, you'll notice how this restaurant is so packed with native Korean executives and even ahjumma(s) (old lady) with family. The waiters are mostly Indonesian but the maître d' or Headwaiters and the store manager, as far as I could see, were all Korean. The restaurant has a great ambiance with enough warm lighting and two types of seating: dining area and bar-like seating. Korean Chopped Salad (IDR 35k) - Napa cabbage, radicchio, papaya, bean sprout, lentil and black sesame with fried spring roll pastry with soy dressing. Can you tell from the description and photo above that it's full of distinct flavors that just work really great together? Although I think maybe some additional protein won't hurt. White chicken (IDR 35k) - crispy chicken and okra with citrus chili soy sauce on the side. I think they forgot something. It was served with fat-whole-bright-orange-ish chili that was.. SUPER HOT. But I love spicy. So what I did back then was saving some of those chili goodness to add on my Jangjorim Bibimbap. The crispy chicken itself was just your regular tasty Korean fried chicken. Good, but wasn't a surprising taste. The dipping sauce was great, BTW. Japchae (IDR 60k) - Stir-fried sweet potato starch noodles with spinach, onion, pepper and bulgogi. It was delicious. But somehow what was served to me that day tasted a bit sweet, maybe they've adjusted the recipe according to our local Indonesian's tongue. And this was considered appetizer, by the way. Enough portion, in fact it's quite big for appetizer! 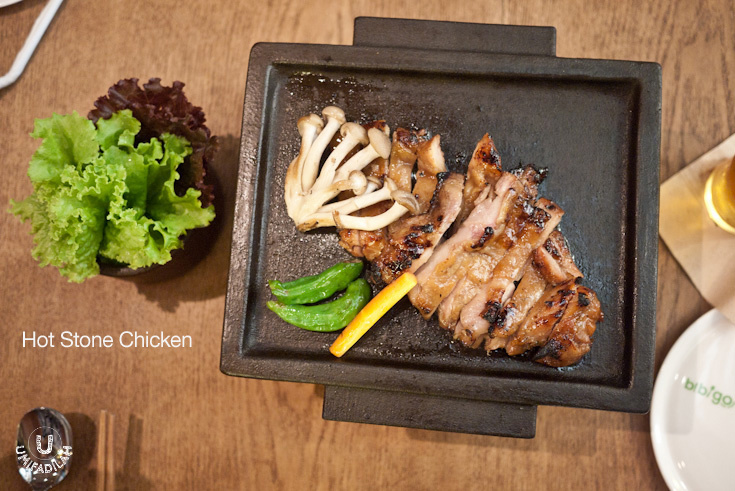 Hot Stone Chicken (IDR 75k) - Bibigo special sauce marinated and char-grilled chicken thigh with shimeji mushroom, carrot and green pepper. It looks exactly like the picture on the menu, in fact it's even better! Juicy chicken thighs grilled to perfection, glazed perfectly. This was served with a small bowl of fresh lettuces and a dipping Ssam sauce, so that you can eat them like how Koreans eat it: wrap wrap! Meet the classic dish of Bibigo. Scratch that. Not only Bibigo’s, it’s the staple of Korean food culture; probably the MOST well-known Korean dish that is celebrated through generations. Bibimbap expresses the Korean tradition of sharing and embracing, it combines every diverse element of proteins, carbs and fibers, as well as maintaining the perfect nutritional balance all in one hearty bowl. Yes. 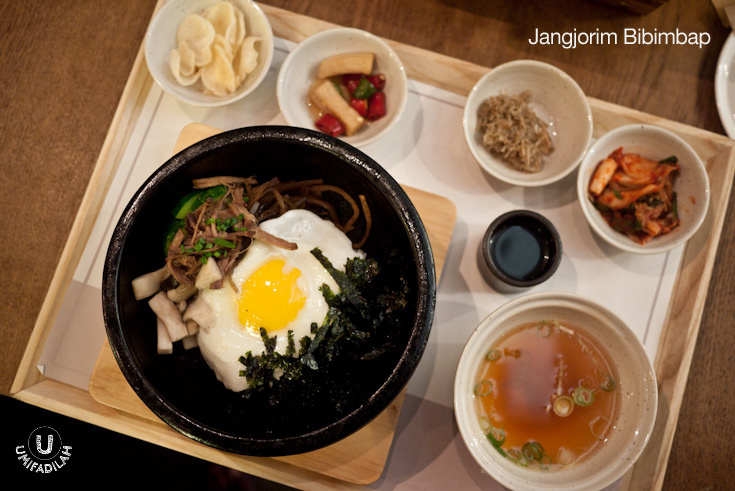 Bibigo encourages you to customize your own Bibimbap. First, choose among 4 types of rice: Long Grain White Rice, Korean White Rice, Brown Rice, and Black Rice. Second, toppings: Char-grilled Bulgogi, Chicken Breast, Chicken Teriyaki, and Tofu. Last thing to do to blend all the flavors together: Pick between 4 sauces. Kohot (red pepper paste/gochujang), Citron Soy, Sesame, and Ssam (a spicy paste generally used for eating food wrapped in leaf, Korean style. Basically a mix of fermented soybean & chili pepper paste). I’ve only visited Bibigo twice. Too bad I didn’t bring my camera on my first visit but at the time we tried Red Chicken for appetizers, Bibigo Rice with black rice + char-grilled bulgogi and also Bibimbap with brown rice + chicken teriyaki. We also tried all 4 sauces. The Kohot sauce made of red pepper paste/gochujang was great but again, more tendency to the sweet-side. But surprisingly what I like best was Sesame & Ssam sauce. 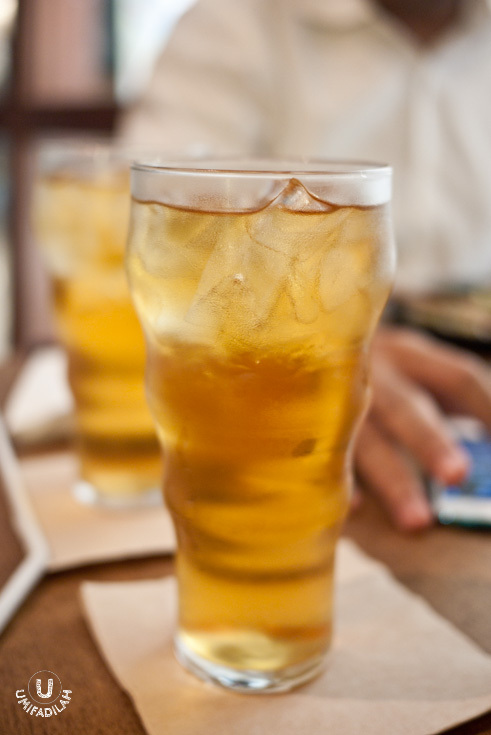 It has that elevated ‘zing’ that goes really well with sweet toppings such as Bulgogi/Chicken Teriyaki. Overall, from my experience I needed a bigger sauce-jar because it just wasn’t enough! Strange enough that on my first visit, they actually let me to order 2 different sauce in each Bibimbap order, but on my second visit, the waiter said that I couldn’t. That they would charge another additional IDR 10k for every additional sauce. Oh well, inconsistencies do happen on newly opened restaurants. Bibimbap (IDR 80k for Bansang/set; IDR 65k ala carte) - Traditional mixed rice with assorted vegetables and a topping. We picked Korean White Rice, with char-grilled Bulgogi, and Kohot sauce. 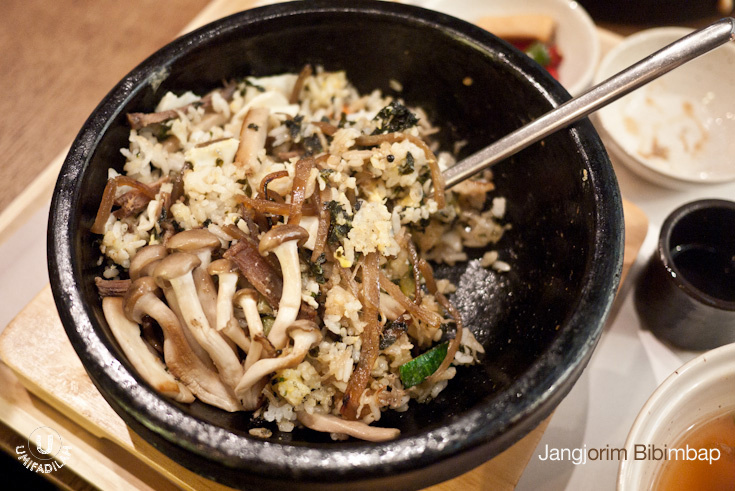 A closer look to Bibigo's original Bibimbap. Bibigo Rice (IDR 80k for Bansang/set; IDR 65k ala carte) - salad type healthy Bibimbap. The portion was so big & fulfilling, even more fulfilling than regular Bibimbap because of the addition of leafy lettuce bed at the bottom. This time ordered with Korean White Rice, char-grilled bulgogi, and Sesame sauce. Jangjorim Bibimbap (IDR 85k for Bansang/set; IDR 70k ala carte) - Bibimbap topped with braised beef in soy sauce, fried egg, seaweed and assorted vegetables in sizzling hot stone bowl. Overall, this type of bibimbap has a slightly sweet flavor tendency. Yes, more like Japanese dish because of the addition of shredded nori/seaweed. If you don't like spicy Korean sauce this might be the perfect choice for you. Jangjorim Bibimbap, after being mixed thoroughly. Oh and I added the shimeji mushrooms from the appetizer's Hot Stone Chicken earlier, super tasty and well-seasoned! No fancy drinks at both of our visit. Oh, but if you’re into alcohol they have 3 selections of Korean Soju Cocktail, that is basically soju mixed with fresh fruit: Orange Soju, Lemon Soju, and Berry Soju. All for IDR 95k. In the end it was quite a pleasant dining experience at Bibigo. But I did get confused mostly because of the tendency of their overall flavors which is slightly sweeter – maybe that’s their intention to adopt to local Indonesian’s tongue. When I went to Seoul last year I’m sure that, what was said to be ‘authentic’ Korean flavor tends to be far hotter than this, and I think we could still handle that (hey we eat Nasi Padang & Manadonese cuisine daily so we’re used to spicy things, right?!). So the question remains, “Just how authentic is ‘authentic’?” It’s always different for every personal experience. You’ll have to go and experience it yourself. Next dishes to try on my list: their Samgyetang (Ginseng Chicken Stew - IDR 150k), Chicken Kimchi Fried Rice (IDR 70k), Jjimdak (Soy Sauce Chicken Stew - IDR 120k), Braised Oxtail (IDR 150k) and of course their Galbi (IDR 180k) .....Oh God I just wished that every day is a payday. How can we ever survive in Jakarta without street-foods to balance all of these fancy eat-outs spending? Lol.